Sharks are having a bit of a renaissance at the moment what with the success of the 'SHARKNADO' films and the 40th anniversary of 'JAWS' recently. 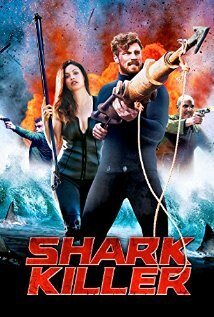 While 'JAWS' is a serious film and 'SHARKNADO' is full of fun, 'SHARK KILLER' could possibly be the lovechild of both these films. Our film follows our lovable shark hunting hero Ace Hunter as he is hired by his brother Jake to locate a shark that has stolen something from him.....a diamond which now lies within the belly of the beast. Though unbeknownst to Ace at this time the diamond is not his brothers but the owner is Arnold Vosloo a rival crime boss of Jake's. On his mission for the diamond Jake enlists Jasmine (his girlfriend) to keep an eye on Ace, which could be a bad idea as Jasmine falls in love with him as the film progresses. Vosloo now aware of this puts Ace in a predicament, bring the diamond to him or die. It now becomes clear that loyalties will shift, as crime boss fights against crime boss, brother against brother, and man must conquer nature, as Ace strives to rescue Jasmine and be the hero he knows he can be. Full of one liners, attractive people, explosions and a shark that just won't quit, 'SHARK KILLER' is a fin-filled experience that any fan will enjoy.